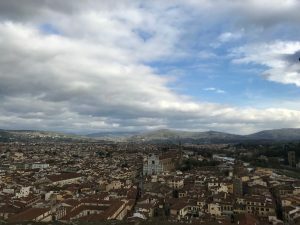 Thinking back on the first day I arrived in Florence feels like it could have been yesterday. The eagerness to arrive, the overwhelming excitement, the jet-lag and excruciating heat all come flooding back. At that point, it felt like I had endless amounts of time in the city of my dreams. 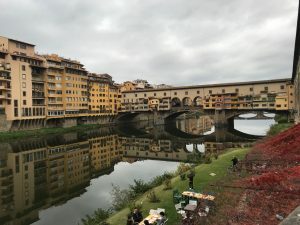 Now, with a mere 3 weeks left in Florence, as I think of all the things I’ve done and seen, I can truly say I fell in love with Italy and will miss it every day that I’m gone. Here are a few tips and tricks I’ve learned along the way that have made my stay all the better. Spend the same amount of time taking in what’s around you as you do taking pictures. Personally, I take pictures everywhere I go, and tons of them. For me, it’s because I know the second I look away I’ll forget what was in front of me and I want to be able to see where I’ve been later down the road. But for as many pictures as I take, I always try to take the same amount of time actually looking at what I’m taking the picture of. You’ll always be able to see the image behind the screen, but not what is right in front of you. I cannot stress this one enough. I’m personally a very impatient person, it’s a problem I’ve always had. But when I had to immerse myself in Italian culture I quickly realized that patience is truly a virtue, one that I would need to learn. Fast. 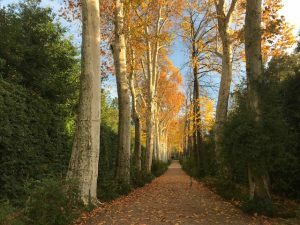 Between the language barrier and the slowed-down pace of Italy it can be frustrating at times to communicate and get things done. For instance, going out to eat at home can be done in an hour whereas in Italy it may take upwards of 3 (especially if you’re enjoying a traditional 4 course Italian meal.) With time I’ve learned to appreciate the Italian-paced lifestyle and adapted pretty quickly. That being said, allot yourself plenty of time to get from place to place. 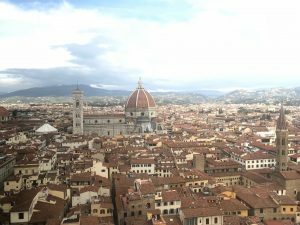 Even though Florence is a small city, walking across town can take a while, especially during tourist season. With narrow sidewalks plus crowded streets walking from one destination to the next can take longer than expected. Fortunately, in Florence there is an app called Mobike that makes getting around a lot easier. Once the app is downloaded, you can unlock any Mobike by simply scanning the barcode. Rides are less than 1 euro which make it an affordable and efficient way of getting around town. Some of my favorite parts of the semester have been simply going on walks throughout the city and taking it in. Cliché sounding as it is, there is nothing that looks, smells or tastes like this back home and I’d rather walk and find new places around me than sit in an overpriced cab. Sounds a little cheesy, I know. But keeping a journal not only gives you time to reflect on all the amazing trips you’ve been on and things you’ve done but it is also a way to preserve the memories forever. At any point in time down the road, a written journal allows you to go back to an exact moment you had while abroad and relive it. So when you’re sitting at home, years later, the amazing gelato and margherita pizza won’t seem so far away. Being in artist, I love to appreciate and try to understand beauty. In my painting class in Florence, part of my weekly assignment along with painting figures, my Professor assigns us an hour to sit somewhere and watch. 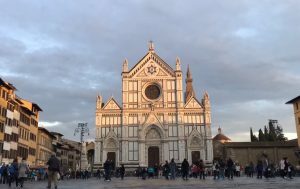 For an hour each week I pick a new location around Florence (Piazza della Signoria, Piazza della Repubblica and Piazza Santa Croce are a few of my favorites) and observe. Later in class we reflect on what we’ve seen, looking for differences in how people behave. Florence is without a doubt, one of my favorite places on Earth. With only three weeks left, I plan on squeezing every last drop of the city I can get before venturing back to the states. Siobhan is a fall 2017 SAI Rome student from Muhlenberg College.